SciFi Question of the Day: Would it be possibile to write a Science Fiction story with traditional Amish as the main characters? Katherine Fixer Noel … I remember that being done, actually. An Amish person was sent to learn ‘modern’ medicine and came back to the farm town. I don’t remember much more about it, unfortunately. Renee McKinley That could be done, I think. With a very interesting outcome. Father has a book along those lines – it’s a generational space ship that has closed off sections containing different earth cultures. Over time the people have forgotten they’re actually on a space ship hurtling through space. A young man in the “Amish section” stumbles into another part of the ship and things go downhill from there. Yep. That was Harlan Ellison’s idea. Daniel Beard Until the producers got their hands on the script. there are reasons I enjoy listening to his CD’s. I also seem to remember a story in Analog on those lines. something about a rouge Amish Geneticist. 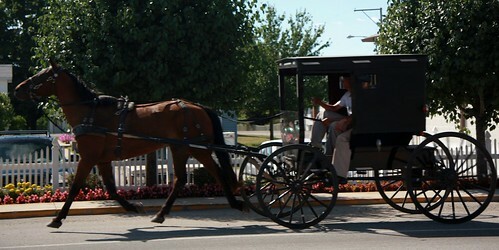 You just have to remember about the Amish is that they do not shun all technology. It is just that technology is never the master, but the servant. And the tech must be proven to be mature. it is not that they do not use tech, they just accept it at a much slower rate than we the “Civilized” slaves of the Cell Phone. Yes. I’ve actually met an Amish programmer. During rumspringa they try a variety of “English” experiences. It could have a “FireFly” ring to it…. Space cowboys….Space Amish…. Yeah why not? Amish person in a future world. The character development alone would be epic if done right. . Most certainly. Traditional Amish set upon by aliens. Or they ARE aliens. Or their traditions are a result of alien influence, or a rebellion against it. Hey, if Abe Lincoln can be a vampire hunter, this is certainly plausible. Jon Varley’s Golden Globe has the Amish on the moon. The Amish trying to survive in a world ravaged by climate change or a virus or any post apocalyptic world for that matter. I have been watching the not so good Revolution, would the Amish prosper in that world? Sure, it would be very possible. Sounds like a great idea, too! Sci-fi characters don’t have to love technology or even use it. Sometimes it’s about how the characters are affected by other people’s use of technology, and how it forces them into dilemmas their grandparents never imagined. Why not have them as the future descendants of modern day Amish. They keep their lifestyle but have relocated to another planet, dealing with even greater technologies and in this case maybe alien life. If the Amish developed a new and proprietary technology that made them fantastically wealthy and 100% independent, they could possibly leverage it to spread their religion. Over time they would become increasingly political and economically powerful, challenging their faith and transforming it. Eventually they would be forced to defend their territory militarily, and an Amish theocracy would take over the entirety of Western Civilization. It would be a common sight to behold police in traditional Amish body armor, polished to reflect the glory of Jakob Ammann, patrolling the streets in armored horse drawn buggies, looking for nonconformist to prosecute. Secret Amish police would stand in every shadow, beady eyes reflecting in the moonlight, silently picking their teeth with stalks of hay.It’s not possible, you say? You obviously haven’t seen Amish Mafia. Oh or even better, the Amish travelled with the rest of humanity to the stars but when a vastly powerful alien race seeks out and destroys humans using advanced tech they leave the Amish to their own devices. I think it would be essential to make sure the Amish characters behaved and thought in a truly Amish way. Inaccuracy here would render the whole story meaningless, because we’d be putting the name ‘Amish’ on people who were not really Amish. I agree, +Mary Jeddore Blakney – it would be more challenging to write, and much more rewarding to read.+Jyoji Fee – don’t you mean “leave them to their lack of devices”? 🙂 Sounds like a good start! What if they were left to their own devices, but had to use modern technology to survive in their new environment? What if those who had been destroyed had been doing all that for them? +Holly Jahangiri Haha. Yeah but butter churners are devices too! Don’t be afraid to +1, now. It doesn’t hurt that much. LOL – okay, +Zachary Besterfield – +1 for participation. I think the lack of it is more to do with the idea of the Amish becoming something completely non-Amish.Of course, that does happen to civilizations – cultures change, morph into something that’s almost unrecognizable – what if one of yourAmish decided to discover his or her real roots?
. Matthew Wynn . Yes the Amish don’t realize it but their whole community has been relocated to a space station orbiting a dead earth far in the future….
. Becky Coleman . Hundred and a half, all Yoders: ideal and ready-made colonists.
. Mike P . No reason not. Aliens land in the middle of an amish farm. Hilarity ensues.
. Mark Jondahl . Any number of weird things could happen in an Amish Community. I think their interpretation of technological matters could make for some interesting writing.
. John Powell . I think there is actually some fertile ground there. For all the reasons listed above, and also I like the potential for a ” slice of life” kind of narrative, with some sci-fi clockwork underneath the veneer.
. Mark Jondahl . “Signs” could have easily been an Amish SF film, with little tweaking.
. Wing Kearns . Earth Final Conflict has done this.
. Billy Couvillion . Rumspringa in space.Or, more seriously, a post-apocalyptic story where technology has failed (like “Revolution” or “Dark Angel”), and suddenly the Amish are the best equipped for life in the new world.
. Becky Coleman . Just finished Pratchett’s and Baxter’s The Long Earth. Brief mention of an Amish colony on one earth iteration. And yes, I enjoyed the book. No disc world fun and games, but interesting – abrupt ending – will be a second book, evidently.
. Becky Coleman . And, why is Dark Angel not in syndication?
. Billy Couvillion . +Becky Coleman Your mention of a planet settled by Amish brings to mind Cordwainer Smith’s “Norstrilia”. While the Norstrilians weren’t Amish, they did eschew most technology to maintain a rural, agrarian culture, albeit one protected by bloodthirsty psychic weasels.
. Becky Coleman . Need a weasel!
. Becky Coleman . Well Luis, with a wide mean streak.
. Mark Jondahl . All humans are wiped out except the Amish.
. David Evans . For all practical purposes the TV show Revolution could have easily had strong main Amish characters.
. Doug Grayson . First thought: An Amish community overcomes xenophobia to teach a technology-laden alien race how to return to their natural roots and come together as a community.
. David Grigg . Why not? Great idea.
. Stephanie Chaptal . Yes. What if E.T. lands in Amish village ? What if Earth must be evacuated and how Amish will go ?
. Nathan Weinberg . I guess they would be probably better off in a post apocalyptic scenario where some technology is no longer available.
. Dennis Howard . I don’t see why not. The Dazzle of Day by Molly Gloss is about Quakers in space.
. Brian Peters . Of course. There we were roofing the old silo when one us looked up to an odd noise…….
. Melissa Walsh . Actually, I’m trying to plot one of those right now. The main character is Amish and has the power of technomancy (can control electronics with his mind). His family thinks he’s cursed since whenever they go into town, electronics act weird or blow up around him. Though most of the story takes place after he is pushed out of his Amish town.
. James Mayes . And there you have it. Go for it!
. Shoe Skogen . Absolutely!
. Mark Means . I would have to agree with everyone else….a resounding yes.Especially in a post apocalyptic setting….
. Brett Bussart . Yup, as a starter colony or what Paul Riser called a Shake and Bake colony in Aliens.
. Joanna Staebler-Kimmel . I think This Star Shall Abide by Sylvia Engdahl may be one of those. It’s a society where use of metal and machines is forbidden to all but a select few. This entry was posted in SciFi Q of the Day and tagged Amish, Amish Mafia, bloodthirsty psychic weasels, SciFi, Zero. Bookmark the permalink.